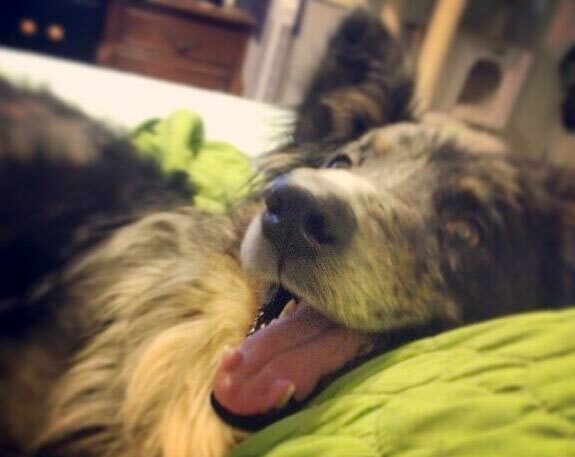 Tripawds Community member abby33 is recipient #52 of the Maggie Moo Fund for Tripawd Rehab. 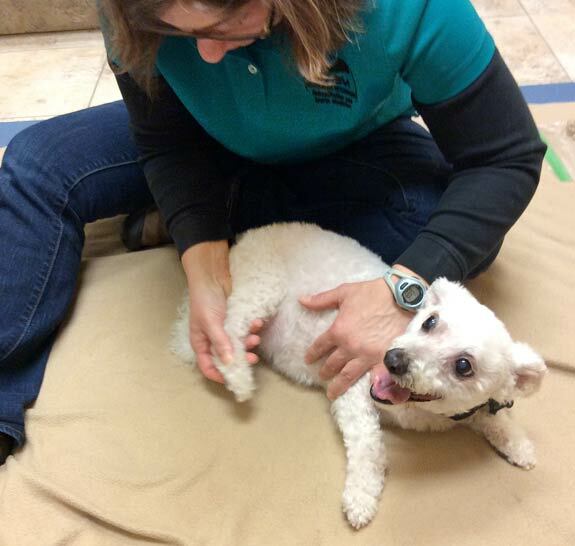 Read on for details about the benefits of canine rehabilitation for three legged dog Abby. See all Tripawds who have received free rehab sessions thanks to your support. 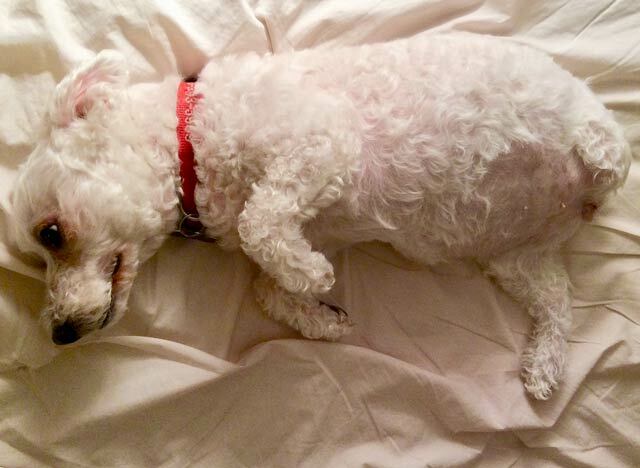 Our story begins 4 ½ years ago when a sweet, energetic, stray, was put up for adoption. One look at her and my heart knew her forever home would be with us. After a fun meeting with our two other dogs Abby came home. Abby is a comical girl doing party tricks and running a playtime agility course at our park district. 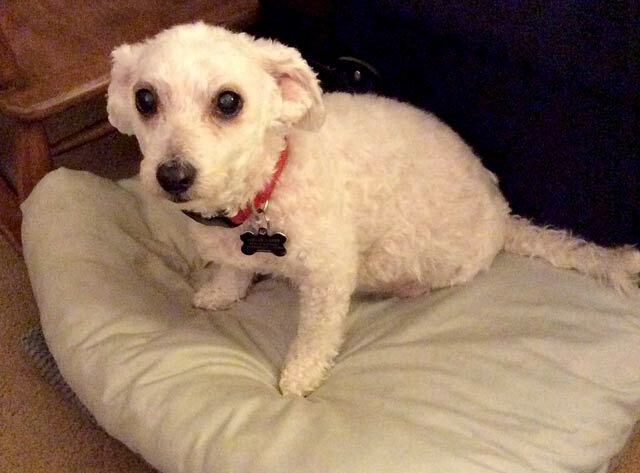 We believe Abby is a 14.5 lb miniature poodle mix about 10 or 11 years old. About 9 months ago I noticed a growth between the digits on her left rear paw. After 3 vet opinions and 3 needle aspirations all showing only blood cells, the 3 vets each suggested take a wait and watch approach since it looked & felt like a cyst. The growth never bothered Abby and she didn’t even seem to notice it. Then last May the growth popped up to twice the size and became very red. A biopsy was ordered and to our dismay it was cancer. Without knowing what kind of cancer, and after many prayers, we agreed to a whole limb amputation in order to achieve the widest margins possible. Pathology on the mass was a soft tissue sarcoma and gratefully no lymph node infiltration. We believe the limb amputation was the right decision. When the surgeon suggested Abby’s best chances for getting the widest margins was to amputate her rear leg at her hip I just about fell over! How will she survive and live with an amputation I asked? This is all so new to me. The surgeon stated dogs do very well on three legs and he expected her to do well also. Abby’s limb was amputated on June 20th, 2018. She has in fact healed well and can get around. After the surgery I inquired about physical therapy. The surgeon said because she’s a small dog she will figure it out on her own and would not necessarily need physical therapy. So I followed all his instructions post surgery and Abby began compensating as best she can. But over the last month something was nagging at me. Abby is showing signs of not wanting to move much and she has lost what I call her Joy of Life, her “joie de vivre” She seems less interested in the world around her, cannot go on the sofa to look out the window and bark, does not greet anyone at the door anymore, and has to be coaxed out of her snuggle bed. Cannot walk up our back stoop and sits and cries to be picked up. Once Abby is up and outside she becomes interested in her surroundings, but something told me she could have a better quality of life if she had more strength & stamina. Weight management is key to any canine rehab program. That’s when I searched online and found the wonderful Tripawds website with a wealth of information. I started to understand more about caring for tripawd dogs and that physical therapy for dogs like Abby was a real thing and incredibly beneficial. So Abby had her Rehab Evaluation on Dec. 26th, 6 months after her surgery. We met with Dr. Rosemary LoGiudice, DVM, Diplomate ACVSMR, CCRT, CVA, CVSMT, FCoAC, at Integrative Veterinary Rehabilitation & Sports Medicine, Hanover Park, Illinois. Dr. Rosemary was very informative & thorough. Even though Abby’s weight is where our surgeon wants it, Dr. Rosemary explained how Abby would really benefit from losing about a pound of weight. Explained that her weight is not as evenly distributed as before and any extra weight is adding more pressure to her joints. So that was our first homework assignment. Dr. Rosemary suggested cutting down on Abby’s food portions and adding green beans. The green beans will add fiber and a feeling of fullness. And Abby loves them. Dr. Rosemary also gave a chiropractic adjustment as Abby’s alignment was off. Dr. Rosemary stated that Abby would most definitely benefit from Therapeutic Rehab. During the evaluation I was so excited to learn that I will be given home instructions for exercises & message therapy, that I didn’t even think to take pictures of Abby while Dr. Rosemary was doing her evaluation. Dr. Rosemary also explained using an underwater treadmill would help with Abby’s weight loss while building her muscle tone & strength. I was happy Abby would be in warm water to spare her joints while building muscles. Unfortunately we had to wait a few weeks to schedule Abby’s first therapy session due to a test finding protein in her urine. She finally had her first underwater treadmill session Friday, Jan. 18, 2019, and her had first massage therapy session. 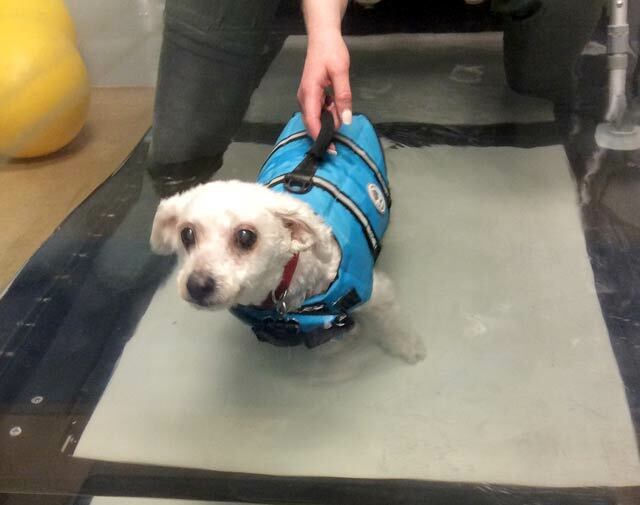 Abby did very well with the underwater treadmill and I learned that the warm water combined with her walking is a very good workout for her muscles even though it doesn’t look like it. Her water therapist, Shannon, explained that even though the water gives buoyancy, Abby’s muscles are getting a very good workout with no trauma to her joints while the warm water helps increase flexibility and improves circulation. I found it interesting that Shannon looks into a mirror on the wall to watch Abby’s stride in the water. Then we went on to her first massage therapy session with Allison. Abby was a bit anxious during her session as I think she was ready to go home. She did pretty well and Allison allowed me to take videos as she explained the techniques to use at home with Abby. I also received a handout of the massage techniques. I learned that massage therapy is extremely beneficial as it increases circulation & nerve stimulation. One of the most interesting things I learned was the belief of phantom limb pain feeling where the limb used to be. Allison explained there is some belief that dogs, like humans, may quite possibly still have a sensation their limb is still there. So Allison says when doing her massage, she actually uses her hands to perform massage on an “invisible limb”, as if the limb were actually there. Abby was very still during the “invisible limb” massage, as if she could feel it. I found this so very interesting. And, in addition to several massage techniques, I was extremely interested to learn a technique using my hands for a gentle shaking all over Abby’s body. This was so interesting to me. Allison explained this is a technique to vitalize sensory stimulation. It’s easy to do and good for warm-ups as it wakes up the brain to remind Abby her whole body is still here. The technique is to do this with flat palms & gentle shaking of my hands all over her body. Allison suggested this technique be used before AND after Abby does any exercise or going for a walk. Abby will continue her therapy for eight weeks with an evaluation at each 4 week session. Her therapy program includes underwater treadmill, massage therapy, therapeutic exercises (with instructions for me to do at home), and chiropractic adjustments as needed. I have included photos of Abby’s first treadmill & message therapy session. What did I learn from this experience? Many things, particularly that therapeutic therapy (or PT as we humans call it), is just as necessary & beneficial for our companion animals as it is for us after surgery or injury. I also learned to listen to the surgeon but go with your gut, and reach out to those who have had similar experiences. And through this whole experience of cancer diagnosis, amputation, & therapy, I see our little Abby as a brave girl & great life teacher. During her therapy session she just simply adapts and has fun. Just like she has adapted to losing her leg. One day she had 4 legs, now she has 3 legs. What a great life lesson I continue to learn every day from my girl about Acceptance. Do your best, accept where you are, and enjoy life. I am grateful for all the Tripawd dogs & cats, and their Tripawd parents, as they inspire me to remember… “Life isn’t about what happens to you… it’s about how you react to life that matters”. Thank you Abby. Thank you Maggie Moo Fund.